The weather is still cold and wintry, which means the soup pot is a permanent fixture on the hob until the weather warms up. This also means that at the farmers market there are the most amazing winter vegetables available. White turnips, purple turnips, parsnips, cauliflowers... all these wonderful veg for roasting and making thick and satisfying soups. Oh so tempting! 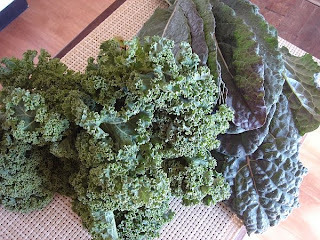 Last week I bought some Kale and Cavolo Nero. For those unfamiliar with these veg, they are related to the cabbage family. Cavolo Nero is also known as 'Italian Cabbage', though it looks and feels more like a tougher, leathery form of silver beet. Kale on the other hand looks more like a thick, plasticky lettuce. (For any Americans, Kale is closely related to what you know of as 'Collard Greens'). Both are very high in vitamins and have a deliciously earthy flavour when cooked. My mission was to use these two ingredients in soups. 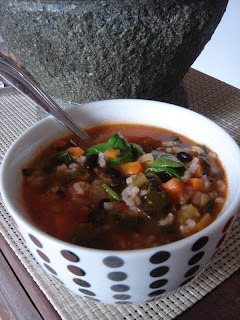 I ended up making two soups, Italian Wedding, in which I used kale in place of escarole (endive) and a Minestrone, where I used the Cavolo Nero in place of spinach. 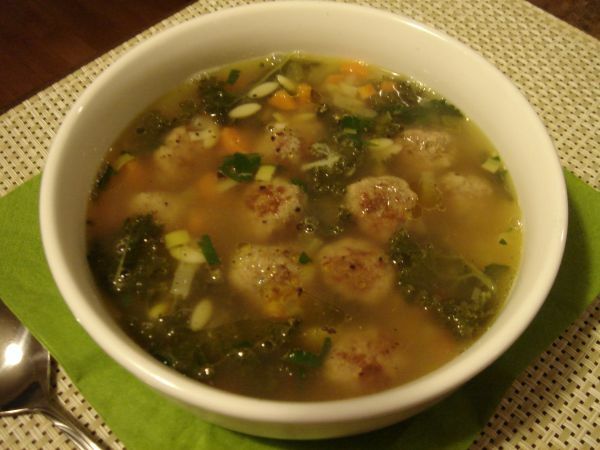 Out of the two soups I made, I have to say that the Italian Wedding was my favourite, I think because of the meat balls which, in a soup are a satisfying and surprising addition. The Kale gave it a nice earthy flavour. It made it taste 'healthy' if that makes any sense! To the mince, add onion powder, oregano, chili, salt, breadcrumbs and egg. With clean hands (or a wooden spoon) mix well together to combine. 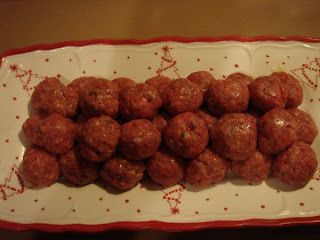 Using wet hands, form into small meatballs and set aside in the refrigerator for about 30 mins. In a saucepan, heat 1 tbs olive oil and add carrot, celery, garlic and onion and fry for about 3-5 mins or until onion is translucent. Add chicken stock and bring to a simmer. Add risoni or orzo. Heat a frypan and add 1tbs olive oil. Add meatballs and fry until golden all over. Add browned meatballs to the stock mixture. Bring to a simmer and add your chosen greens. Simmer until greens wilt slightly. Season to taste and sprinkle some grated Parmesan cheese over the top. So there you have it. I had an exciting weekend fossicking at the markets for some new veg (for me finding new greens is exciting!) and used them in a nice new hearty soup, which I am sure is going to become part of my Winter repertoire. Oh, I'm wishing we had high-speed intercontinental trains or plains (Excuse me, but may I borrow an SR-71!? ), this sounds SO GOOD, I want some, like NOW!! !